This summer, I was lucky enough to be able to travel to Bulgaria with two Bulgarian friends that I had met and grown very fond of whilst studying at University. As they are both from the capital Sofia, this was the city I was most enthusiastic about visiting during the trip. In Sofia's diverse history, numerous empires (Roman, Czarist, Ottoman and Soviet) have left their influence all over the city. This has resulted in an architectural feast for the eyes that when accompanied by cobbled streets, the most gorgeous parks and all the street art, you can see why Bulgarian's are very proud of their capital. Relaxed, youthful and drenched in history, Sofia is honestly unlike any city I have traveled to before. Sofia also seemed incredibly genuine. Whether this was the good company of two of my favourite people and their welcoming families, or the general lack of tourist traps around the city, I was so pleasantly surprised by the laid-back energy. One of the things I always like to look out for when travelling to a city is a viewpoint! There is something about seeing where you have been roaming from afar that lends a new appreciation to your travels. One of the best views of Sofia is next to the Kopitoto TV tower. You have to walk through an abandoned cable car station (in the dark it's pretty creepy! ), but when you get to the other side, the view of the whole city below is so worth it. In the summer, people come along with their friends to hang out and enjoy the lights of the city below. In the summer in Sofia there is no better way to spend time than to take something to eat or drink, seek out one of the parks and just chill. Sofia is one of the greenest cities I have visited! I was taken to City Garden, home to the National Theatre where chess players sit on benches, friends sip iced tea, couples wander dreamily and street musicians serenade. Often when I visit cities, I am always in a rush to see everything that I rarely take time to breathe. Stopping in this park to take some time out from our city tour was not only well needed and appreciated, but it gave me a glimpse of authentic Sofia, where the locals are! Being shown around Sofia by those who have lived and grown up in the city was something special. During my stay, I was invited to dine with my hosts friends and family on numerous occasions. Dining in Bulgaria is different to what I am used to and if you ever get the chance to do the same you have to! Bulgarians can sit around a table for hours. They toast pretty much after mouthful (Nazdrave! ), take their time and enjoy the whole eating experience. It was honestly so lovely to slow down and just enjoy the company. Sofia is full of rich history and so it is no surprise that the buildings throughout the city reflect this. On one street you could see a mosque, an orthodox church and a soviet structure all next to each other! I loved this about the city. There is such a welcoming atmosphere around Sofia, with different people and cultures and I just love that the architecture highlights this peaceful balance. Visit Alexander Nevsky Cathedral to gawp at one of the biggest Eastern Orthodox cathedrals in the world. It is absolutely stunning! Do not miss Ivan Vazov National Theatre in City Garden. In the summer, it makes the perfect backdrop for an outdoors theatre, where you can listen to musicians perform or watch a play. The Church of St George is equally impressive. Although there is a lot of travel options to get you around the city, I would recommend walking from place to place because the streets are just packed with interesting beautiful buildings! Make sure you also stroll through Tsar Ivan Shishman Street where you can find funky street art and loads of quirky coffee hangs and shops. Sofia is brimming with architectural reminders of a very interesting history and so just walking around the city itself is a history tour of some kind. However, I would recommend visiting the National Museum of History if you are interested in finding out more about both the capital and Bulgaria. Before I visited Bulgaria, I had slowly been learning about the history through my friends Doroteya and Kaloyan. I'll admit, before I met these two, I did not know much about the country at all. It was so cool to wander around the museum and gain a more detailed picture of the history! My favourite part of the museum was the section where traditional Bulgarian clothes are displayed. The costumes are stunning and I loved seeing the differences in the dress for different geographical areas. Made in Home, Angel Kanchev 30A, Sofia 1000. Made in Home is a quirky restaurant with the cutest decor. We didn't actually eat here but we had the biggest gin and tonic ever (Bulgarians are very generous when it comes to alcohol). All around us people were tucking in to what looked like the most beautiful dishes. My regret is that we did not eat here, but judging by the reviews online, it is not one to be missed should you be in the area! All produce is fresh and local and they even have vegan options! The Cocktail Bar, Angel Kanchev 9A, Sofia 1000. Just across the road from Made in Home, you will find this cocktail bar. You can to sit inside the round glass pavilion or out in the garden in the summer like we did and enjoy the views of one of the loveliest areas in Sofia. This spot is laid-back but romantic (it has all the candles! ), and is a fun place to sip cocktails and chat with friends. Walking past this spot, with its wrought iron furniture, friends catching up and cocktails glimmering in the candlelight, it is almost like glimpsing at a scene from an old movie. Sun Moon, Ulitsa 6-ti Septemvri 39, Sofia 1000. My hosts took me to a very popular eatery for a lunch break. A vegetarian restaurant with an overwhelming amount of vegan options I was in my element. We sat outside in the sun overlooking the small five corners square, people-watching and resting from a six hour tour around the city. As Sun Moon bake their own bread daily, I opted to try some and was not disappointed. There is also a veggie take on traditional Bulgarian food such as vegan banitsas, lutenica and tarator. Sun Moon were everything I seek in a cafe/restaurant, supporting local and organic and offering a diverse menu. The entire time I was in Bulgaria, my friends had raved about Mekitsa, a traditional Bulgarian dough, deep-fried and served with sweet or savoury toppings. So, on my last full day in Sofia and indeed the country, I finally got to try it and boy was it worth the wait! I had mine with icing sugar dusted over the top. It was warm and sweet and SO GOOD. Mekica and Coffee is a cute spot to try this lovely dish, where you can sit upstairs in the window and watch the trams go by in the street down below. It was so special for me to visit Sofia. I was finally able to see the city two of my closest friends had lived and grown up in. I loved meeting their families and hanging out with their friends and just enjoying life on their home turf. It was such an honour to be invited. 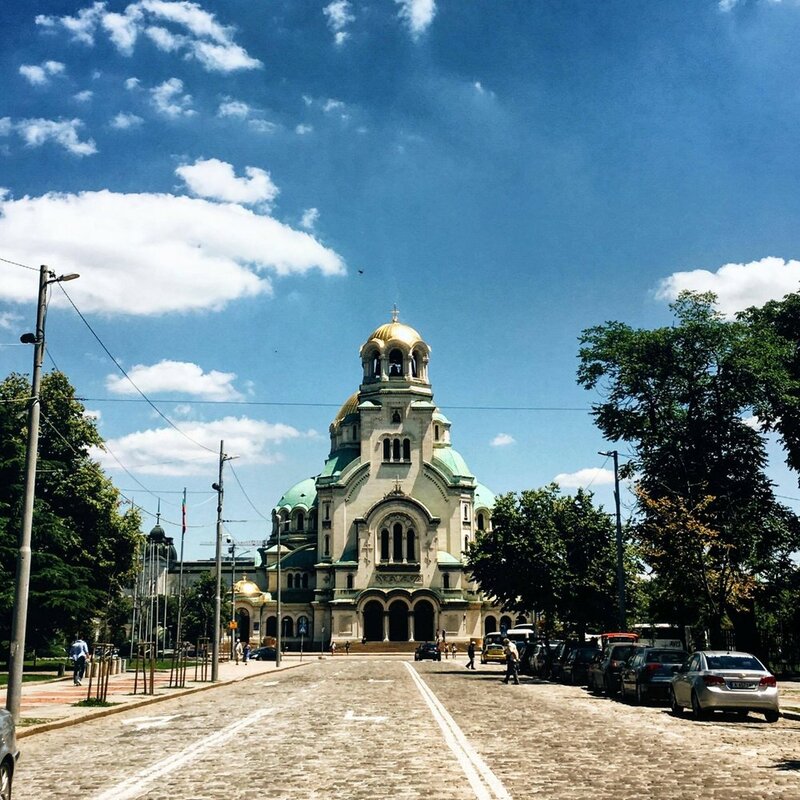 If you are thinking of travelling to Bulgaria, make sure to not miss Sofia! Sofia in my eyes is still pretty much a hidden gem and because of this, there are less tourists and is completely affordable. The buildings are incredible, the history fascinating, the food absolutely delicious and the people just so welcoming!